I’ve been thinking about racks – bike racks – lately. I was cleaning out my storage unit and came upon one of those strap-on kinds in good shape. It went to Reader in the Wild Mathilde. It was better than taking the front wheel off her bike and wrestling it into her car when she needed to transport it. I never trust them for good reason. They come loose and drop your bike on the ground. We were tooling down U.S. 441 at something that felt just shy of the speed of light. After about 10 miles, I looked in the passenger side rearview mirror. She did a bootlegger and headed back up the road to see if we could spot a twisted bike carcass on the side of the road. I could only wonder how many cane trucks had already ground it to dust. I was already planning in my mind what the replacement would be. See bottom of the post for an old memory that just popped into my head. It is only barely connected to this topic, so I’ll bury it at the end. After we had gone several miles, I told her to pull off on the shoulder. I walked around behind the car to see that my bike had slipped off the rack – which put it below the line of sight – but the bungee cord had sort of held it on. Every so often it would bounce off the pavement, resulting in a tacoed wheel and a sanded-down pedal. Not long after that, Son Matt and I were coming back from riding the West Orange Trail near Orlando, FL. When we stopped to make the turn into his housing development, my bike fell off his strap-on rack. If it had happened five minutes earlier at Warp Speed, it would have caused havoc on the highway. 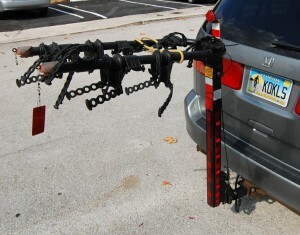 My first hitch-mounted rack was made by Swagman. It was similar to the one pictured at the top of this posting. What I liked was that the bike was held on to the rack by a bar across the top that screwed down. Unfortunately, I grew to hate how long it took to screw and unscrew that top, particularly in the dark at mosquito o’clock. I liked the design of the Yakima Racks better. The bikes were supported by two arms about a foot apart. 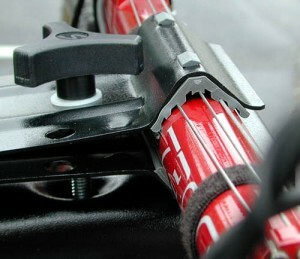 They rested on rubber cradles that could be adjusted to give more or less spacing between bikes. The bikes were secured by heavy rubber straps that were quick to put on and faster to remove. 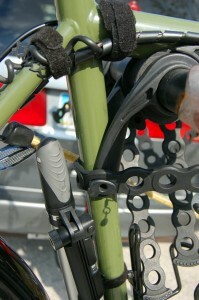 One of the pair of cradles for each bike has an anti-sway arm that keeps the bikes from rocking into each other. Bikes were held higher than on the Swagman. I never had to worry that the bikes would drag the ground. Instead of a simple locking pin, the rack bolted to the hitch receiver to eliminate sway. The bikes don’t get whipped around like a dog wagging its tail. I was concerned that being exposed to the sun all the time would cause the rubber straps to break down, but I haven’t seen any evidence of it in the last three years. How about the Yakima SlickROC 4? www.chainlove.com has put this model on sale twice recently. I bought one for Son Matt for his birthday and one for Son Adam to reward him for completing his first triathlon. The SlickROC is similar to the KingPin 4, except that it comes with a Deadlock cable locking mechanism to keep your bike safe from honest people and it has a more convenient way to swing down the arms without pulling a pin. In the long run, it may not hold up as well as a simple pin, but it’s more convenient to use. A five-bike rack holds five bikes about as well as a two-man tent holds two men. They’ve got to be either very small or very friendly. The pins that came on my KingPin 4 had safety straps made of plastic to keep you from losing them. They arrived cut. Instead of sending the rack back, I went to a local sporting good stores and bought a stainless steel fishing leader with snaps and swivels on the ends and used it instead. When I upgraded to the KingPin5, I cut off the plastic junk and started off with stainless steel. 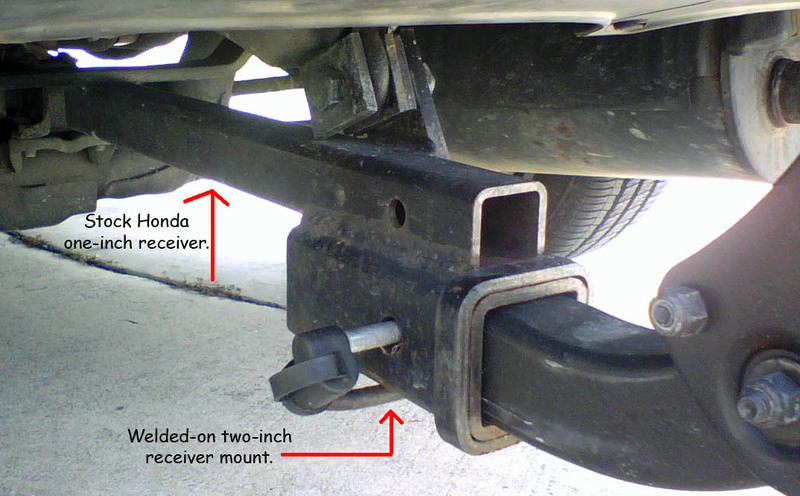 He sold us a hitch receiver extension (and even trimmed off 3/4″ inch and painted it). Problem solved. Where have I bought my Yakima Racks? I’ve had good luck with ORS Racks Direct. They’ve been good at competitive price matching. When I ordered this item on March 29, I took advantage of the 10% in-store discount, but I specifically asked if there were any sales coming up. The answer was no. I should be happy with the 10%, but it torques me off a bit to get an email from you two days later – before the rack has arrived – telling me that I could buy it for 20%. off now. You might want to look at your mailing campaigns and not send stuff out like that if an order is en route. The SlickROC4s were ordered from chainlove.com. (Their ad is at right.) The only catch is that they put up specials all day long for specific times or until the product is sold out. You have to watch for their alerts to snag stuff; you can’t just order from a catalog. Still, their prices are good. 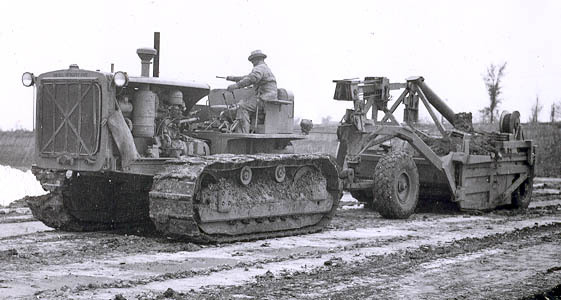 When I was about 10 years old, dad was building a road down in the Southeast Missouri Bootheel. 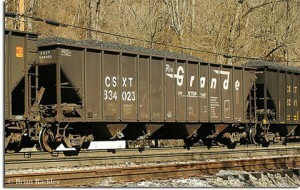 Gravel for the project was delivered in hopper cars to a railroad siding, where it was unloaded into an underground hopper, lifted by a conveyor belt, dropped into a dump truck and hauled to the cement plant at the job site. Dad would let me crawl under the hopper car with sledge hammer and knock out the pin that held the chutes in place. The big chute doors would burst open and tons of gravel would come flying out. The best part would come with the car was empty. Dad would give the car a couple of bangs with a dragline bucket to get the last of the load out and then, while I was stretched out on my back under the car, a guy in a tractor would push the line of hoppers up one space so I could repeat the process. Obviously, I was told not to crawl out while the train car was moving. Of course, looking at it from today’s perspective, I guess I could have mashed my finger with the hammer, been knocked unconscious by the chute door opening suddenly, been buried in a dark pit under 50 tons of gravel until I rode – probably in pieces – up the conveyor belt to be dropped into a dump truck, where I would be mixed up into a load of concrete and become part of a state highway. But, since none of that stuff happened, it was a heckuva summer for a 10-year-old. How did cane trucks make me think of trains? One weekend before we left to go home, I put a whole line of pennies on the main train tracks that were feet away from our siding. I envisioned coming back on Monday and finding them all squished paper-thin as souvenirs I could share with my buddies. Much to my disappointment, the pennies not only weren’t flat. They weren’t there. That’s what I thought had happened to my Trek; it had been mashed to Trekfoil and was stuck to the bottom of some cane truck headed to the sugar mill. I think kids who grew up in the 50s and 60s and weren’t taught that the world is a dangerous place are less afraid than their more-protected children and grandchildren. Kids today aren’t allowed to do the kinds of things we did and, mostly, survived every afternoon. Of course, our generation was taught that we could survive a nuclear explosion just by ducking and covering under our school desks. Another great read and an interesting rack to boot. Thanks for writing this up. I tried to buy a bike rack eons ago at a shop in Palm Springs and they told me I didn’t need one, that it would fit in the back of my Explorer. On rare occasions when I’d like to carry a bike and luggage and such, I wonder if I could strap the bike onto the roof rack without bike parts scratching the heck out of my roof. Your childhood memories make me recall some stuff I did as a kid and wonder how we all survived before all these safety agencies and warnings were invented. Nice service on the “nastygram.” They DO help. I bought a chicken carrying a label bragging about their superior birds. It came with two necks, so I sent a sarcasticgram making fun of their “superior” birds. Because of my tone, I didn’t expect a reply, and was surprised when I got a coupon for a free chicken. It helps if you make up a topic before you start writing. Spending a ten-year-old life knocking the bottom out of gravel trains would be a dynamite post in and of itself. When I was 10-years-old my dad took me to the WMCA and beat the hell out of me at handball. It was no fun, but it was not life-threatening. That wouldn’t make much of a post. I’d tell you a story, but I’m listening ot Aerosmith and I have my on blog. You could probably strap it to the roof of your car, but (A) I’d hate to be following behind you and (B) I bet you’d end up scratching the paint, even if you went to all the trouble of putting padding up there. Rambling, indeed. Guilty. That’s why I put the digression warning in there. In retrospect, I wish I HAD dealt with the digression as a separate post. The more I thought about it, the more I think that it is a valid topic for biking discussion. Except for Scouts and Little League, there weren’t many organized activities for kids when I was growing up. We hiked, camped, fished, rode all over town on our bikes and generally tried out best to stay out of sight and control of grownups until supper time. To us, the world wasn’t a scary place. It was somewhere to explore and have fun. I have lots of stories about how dad let me do all kinds of things that would be considered too risky these days, but he made sure I understand the dangers involved and gave me credit for knowing just how far to go. Letting me crawl under train cars, shinny up crane booms, work on moving conveyor belts and crawl all over heavy equipment gave me confidence that was invaluable as a news photographer. I was lucky to have a father who got to play with life-size Tonka toys. Correction: The bike rack was a present for my first INTERNATIONAL distance triathlon, not my first one. I’ve completed a few sprints and made it 2/3 through a Half IronMan. I don’t remember getting to play under any trains as a kid, but you and mom really didn’t shelter us as badly as the kids now-a-days are. Remind me (or not) to tell you the story of walking our bikes across the railroad bridge over the canal between West Palm Beach and Lake Worth. It’s all fun until you see the light coming. Stuff that involves splashing and running gets blurry for me. 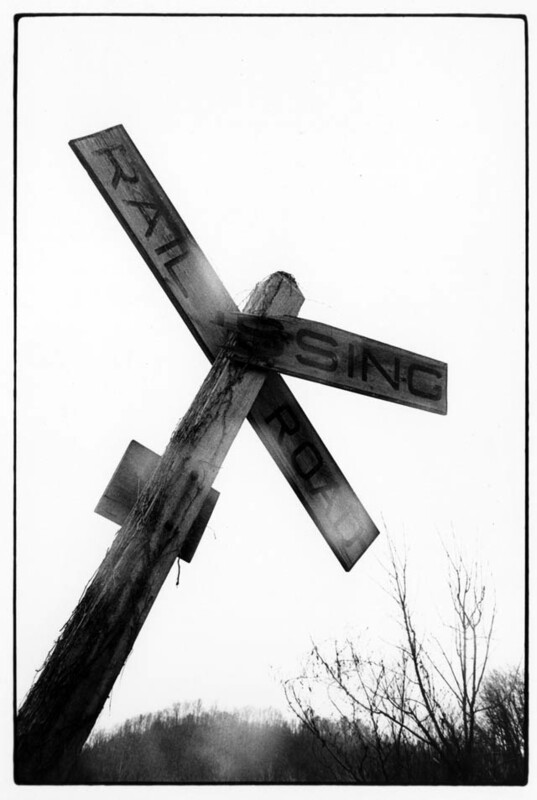 As far as the trestle story, is THAT the reason one of your friends never came by again? Thank you for your posts regarding bike racks. 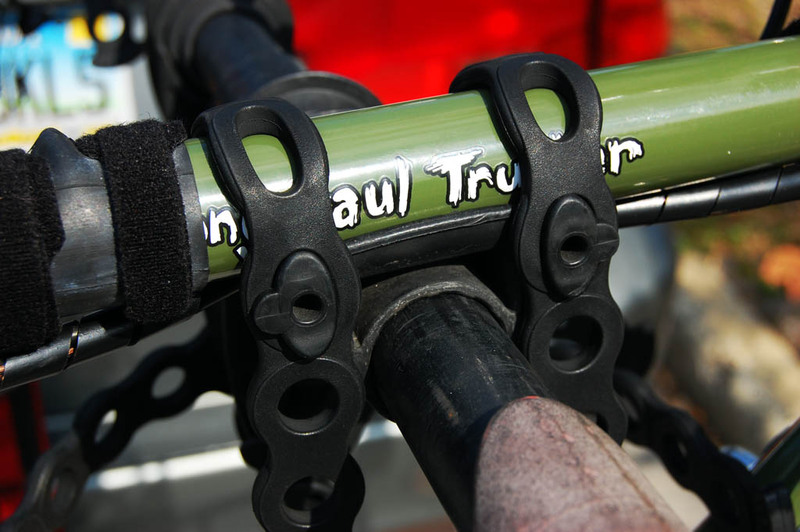 I have been looking to purchase a hitch mount bike rack and your post has been very helpful in my determination of which rack to purchase. I do have one concern. I have a Honda CRV with a spare tire and am concerned that the hitch mount will not provide enough clearance for the spare tire. Yakima’s web site indicates not to use a hitch extension with their bike mounts. 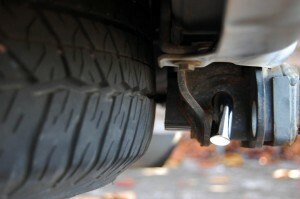 Did you experience this issue or a need for a hitch extension for the CRV in your picture above? I do not want to purchase a spare tire mounted rack, but am concerned that it is my only option. I appreciate thoughts from your experience. My son’s Toyota had to have an extension like I mentioned above. My other son’s CRV has a spare tire mounted on the back and he uses the rack successfully. I’ll email him to see if his receiver gives him any extra clearance or if the rack fit right out of the box. Ginny, I haven’t had any problems with my Honda CR-V and the Swagman bike rack. The Yakima bike rack, too, works just fine on the Honda CR-V, too. I have carried two bikes on the Swagman hanging off the back of my Honda CR-V for more than 10,000 miles and across 20 states. 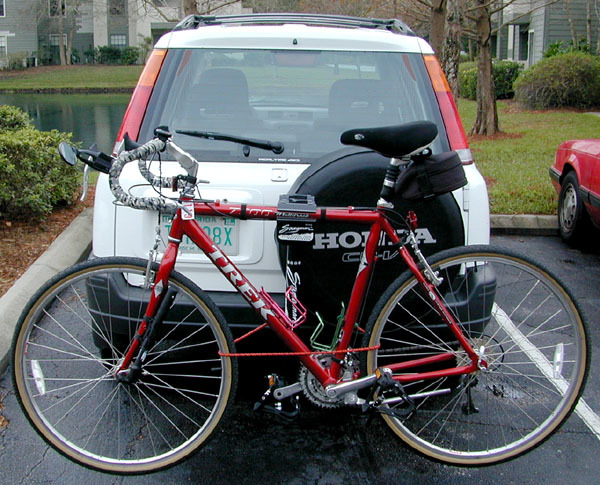 In regards to the Swagman bike rack on the Honda CR-V, there are two hitch pin holes in the rack. The tire does stick out too far to use the hole that brings the bikes closest to the vehicle. So, you have to use the second hole which pushes the bikes out further. Not a big deal but it can make it more likely that the bikes will drag the ground on a steep incline. I do have a somewhat unusual installation, however. As Dad noted, I had a trailer shop weld a two-inch receiver on the bottom of the stock one-inch Honda receiver mount. This allows me to use receivers of both sizes. It cost me less than $40 ($20-something for the two-inch receiver and then another $20 worth of labor) and has added a lot of flexibility. I like the two-inch receiver because it has more surface area. The additional surface area makes for less side to side wobble for the bike rack. There is more torsional stiffness. 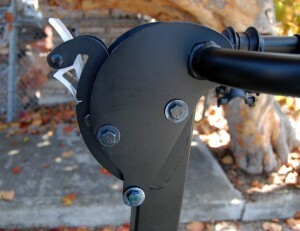 Here is a detailed view of the two hitch pin holes in the Swagman bike rack. You can also check out a detailed veiw of my Honda CR-V two-inch receiver with the Yakima four-bike rack inserted. All that said about the Swagman model I had, the new Yakima four-bike rack is a far better design.